April brings about the northward migration of the Great Hammerhead shark, so the up close and personal dive experience with our favorite Bimini hammerheads is coming to an end. Thanks to all that have enjoyed the experience with us and shared some of the most incredible photos throughout social media! 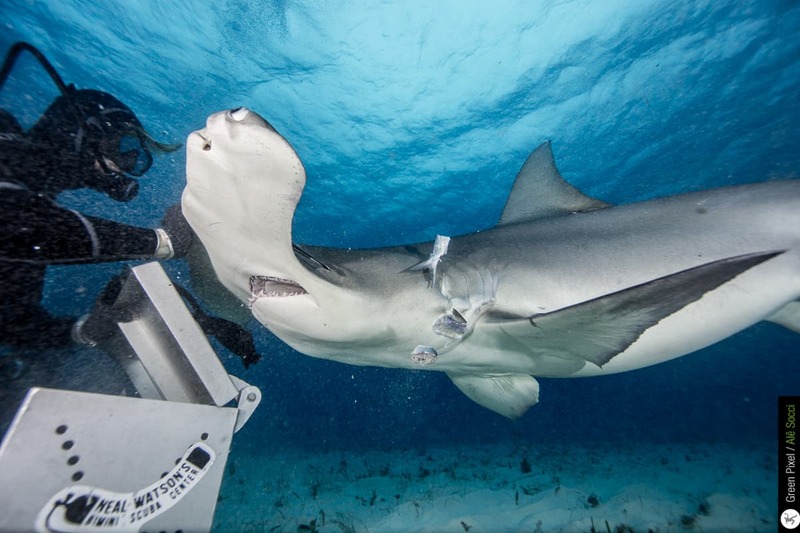 Each year the Great Hammerhead shark makes Bimini it’s winter home because of the warm waters throughout the winter months. But as the waters of The Bahamas warm in the summer months, the ones all of you boaters, swimmers, scuba divers and beachgoers enjoy, it gets just a little too warm for the hammerheads comfort. Each spring around the end of April to early may, the waters to the north begin warming the hammerheads migrate, northward and most likely up to the coast of the Carolinas. While we all miss the hammerhead dive experience, there is great scuba diving in Bimini on the reefs and on the shipwrecks that we all enjoy because of the warm tropical waters. Plus, as an added bonus the warmer waters bring about the playful dolphins so you can enjoy a great wild dolphin experience on a snorkeling trip! Hammerhead fans, no need to worry, the Bimini hammerheads return again around December to once again make Bimini their winter home. For more about all of these excursions visit http://biggameclubbimini.com. Don’t just dream about it, be part of it! •	Make sure you are booking the excursion with your lodging. Occasionally guests book their hotels and airfare before finding out the excursion they want is full or not in season. •	Book your hotel room, flights and dive trips all directly with the resort’s booking office to insure your trips and accommodations suit your needs. No reason to chance booking a dive trip when no rooms are available or have a room with no trip. •	Protect your investment. Credit cards offer trip protection services, but they may be limited. Understand what they protect to avoid a loss in the event something prevents you from making the trip. Trip protection insurance is also worthy of consideration since the cost is relatively low and nearly everything is covered.